These are what the overall measurements of the axles blocks, after spacers are cut and the wheel is mounted. Center being the center of the Wheel and also measuring from the inside the axle block. 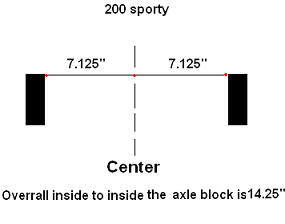 If your measuring from the outside of each axle block, add 3.5" to the overall or 1.75" to each side of the given measurements below. With use of a square or a straight edge and tape measure, the measurement can be found. For overall Axle Lengths scroll down.